The rock group "America" is shown in this photo dated 1976. 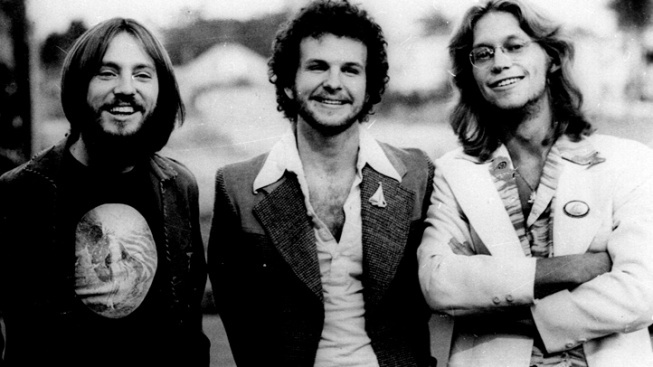 Members of the group, shown from left are: Dewey Bunnel, Dan Peek, and Gerry Beckley. Dan Peek, a founding member of the popular 1970s band America and singer of high harmonies on hits that included "A Horse With No Name" and "Ventura Highway," has died, his father said Tuesday. He was 60. Peek's wife, Catherine, found him dead Sunday in bed in his home in Farmington, Mo., about 60 miles southwest of St. Louis, Milton Peek said. The cause of death was not known, and an autopsy was planned. Dan Peek suffered from arthritis, but it wasn't known if that was a contributing factor. Peek, whose father was in the U.S. Air Force, had met the two other members of America — Dewey Bunnell and Gerry Beckley — while attending high school in London. After signing a record contract, America was an almost instant sensation with songs featuring tight harmonies over catchy tunes. All told, America had three platinum and three gold albums, along with eight Top 40 hits, from 1971 through 1975. "It was a joyous time for the three of us, full of excitement and laughter," Bunnell wrote on the band's website after learning of Peek's death. "We created lasting music together and experienced a life that we could never have imagined." The group's first album in 1971 included the No. 1 hit "Horse With No Name." Other hits followed: "Tin Man," ''Sister Golden Hair," and "Daisy Jane," among them. Peek played lead guitar on many of the songs, and wrote some of them, including the 1974 hit "Lonely People." "Dan & his music will live on in the great songs he shared with us all," Beckley wrote on the group's website. Peek had lived in Farmington since 1978, soon after he left the band. He also had a home in the Cayman Islands. Peek was born Nov. 1, 1950, in Panama City, Fla. His father was in the Air Force and the family frequently moved. He met Bunnell and Beckley in the late 1960s. "The three of them were Air Force brats," Milton Peek said. In the late 1970s, Peek became disenchanted with the travel and lifestyle. "He was a Christian and he just got tired of the rat race," his father said. He left America in 1977 and turned to Contemporary Christian music. His first solo album in 1979, "All Things Are Possible," reached No. 1 on the Contemporary Christian Music chart and was nominated for a Grammy Award. Beckley and Bunnell sang harmonies on the song, "Love Was Just Another Word." It marked the last time the three recorded together, according to Billboard, though they occasionally reunited on stage. A fire in 1978 burned Peek's home and belongings in California. He moved to Farmington, an area where his father was once stationed, that same year. Milton Peek said his son continued to write songs and record in the studio in his Farmington home until his death. He also operated a website and wrote a memoir, "An American Band: The America Story." Just last month he signed copies of the book at a Christian bookstore in Farmington. Peek and his wife had no children. His funeral will be Monday at the Presbyterian Church in Farmington.